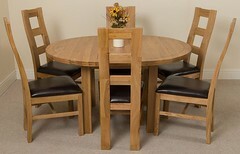 With the choice of 9 table and 8 chair ranges, theirs nothing but a huge variety of choice here at Oak Furniture King. Our dining sets come in many combinations but, if you’re not 100% on our current sets, you have the freedom to create your very own dining set. 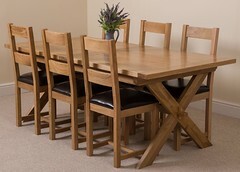 Putting your hard earned money into a dining table will be the best investment you will ever make for your dining area. 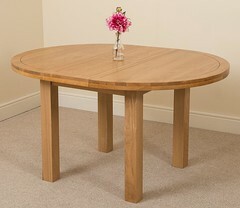 Our solid oak tables are made with the strongest wood available and, when looked after correctly, will last generations. Maintenance is a pretty quick and straight forward. Simply dusting one a week will keep it in good condition, whilst a quick polish every couple of months will help maintain its clean cut look and preserve its longevity. Along with these benefits, oak wood contains intricate grain patterns ensuring an attractive furniture item that offers great style and sophistication – something your guests will also love. 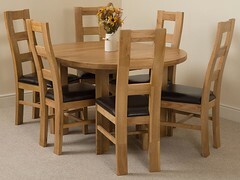 Our wide selection of oak dining chairs along with leather and fabric dining chairs can combine well with any of our dining tables. From the modern look of the Lola chairs, to the vintage style of the rustic Princeton chair, you will be able to find the one perfect for you. The Valencia dining table (Sold on our sister site Modern Furniture Direct) is a stunning combination of glass and wood with its feature piece ‘X’ design base and 12mm thick glass top. 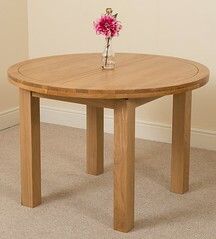 The Valencia dining table is available in 2 sizes, 160cm x 90cm (small) and 200cm x 100cm (large). 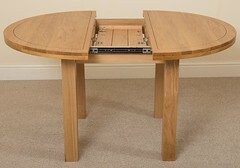 The small table can comfortably seat up to 6 people and the large can seat up to 8. If you don’t have a table yet, we recommend our Mix & Match category to customize your dining set easier. And don’t forget, we offer free UK delivery on all products.